The first stage of establishing a city bus at the Plant named Likhachev was the design and fabrication of a prototype ZIL-156. And in may 1957 came the first of ZIL-158А tourist of execution, issued specifically to service the guests of the VI world festival of youth and students that was held in Moscow. 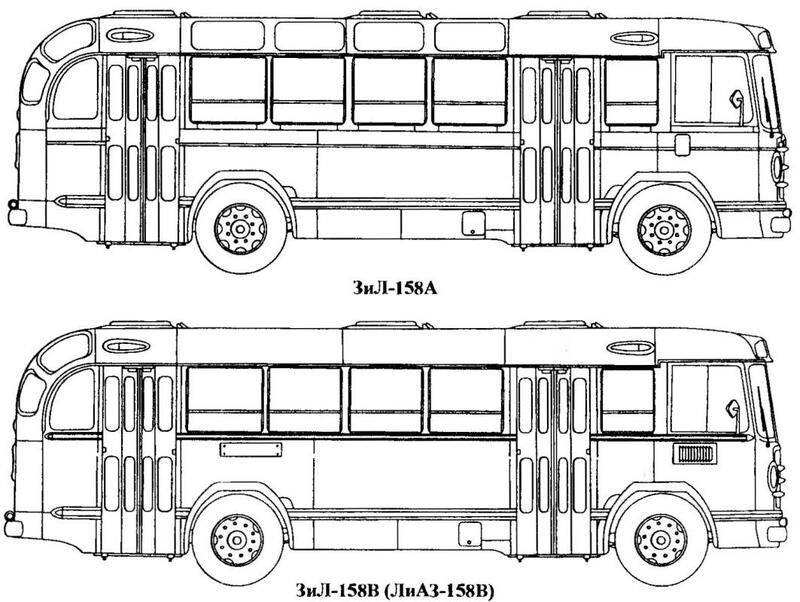 These buses were similar in design to the ZIS-155, many components and assemblies of these machines are interchangeable, distinguished only by the shapes and sizes of bodies. So technically advanced, this bus can be called only in design, which, responding to the fashion of those years, demanded from the developers of the rounded shapes of the body and roof glazing. First of ZIL-158, the plant began to release in August 1957. They differed from the tourist to the lack of glazing on the upper roof and Luggage racks above the seats, a working rear door and seat of the conductor, reduction of two double chairs number of seats, grille and location of decorative glazing beads on the sidewalls. The total capacity of a bus accounted for 60 persons, 32 of them for the seat. The back of the bus — carriage type, all-metal, assembled on a rigid base, as a substitute frame. The bus had three hatches in the roof for ventilation in the summer. The design was used a number of mechanisms and units of trucks produced at the Plant named Likhachev. The body of the ZIL-158 although he had a lot of constructive and operational deficiencies was different, however, the relative ease of repair (so welding was used only for connection box section frames body frames of the rear Windows and the route sign, doors). For connecting the shell plating to the frame used rivets (4575 pieces! ), rivets and bolts (the latter were about a thousand) were collected and the base body, which the Assembly was time consuming, but to remove the body panel using one of the drills. The base body consisting of eight trusses and five of the spars, was not rigid enough, since the latter broke off on the third and resumed on the fifth farm in the middle of the bus. Between them were three longitudinal beams, which did not coincide with the longerons in width and height, so the bus was used reinforced floor of the 15-mm bakelizirovannoj plywood sheets which had a width of 1190 mm. below the base intensified stamped beams under the side walls. This base design was dictated by the need to place a spare tire (on the left between the third and fifth girders). 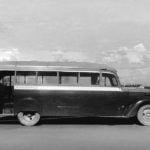 Covering the sidewalls and roof of the bus were made of duralumin sheet thickness of 2 mm, and the front and rear of the trimmed sheet steel. Glazed roof hatches are opened using screw mechanisms. After 1961, on buses, gathered on Likinsky bus plant, glass sunroofs are not installed, and on some machines the hatches. Inside the body is trimmed with a cardboard frame, roof — sheet steel, screw-self-tapping screws. A four-passenger door opens outwards with the help of pneumatic cylinders from the driver’s cabin or from the salon. The widespread use of the bus design contact between a steel and duralumin parts, compounded by poor primer before Assembly, was a serious mistake. Electrochemical corrosion very quickly corroded the metal so if the car visited two to three times that in overhaul, it literally did not remain a live place. On top of the rotten panels and crumbled kerchiefs farms imposed new steel sheets (again without primer), and this has led to new pockets of electrochemical corrosion. The attachment points of the frames of the roof to the sill profile were real gratisporntube, why have frames at these areas completely corrodible ten areas. Besides the Windows open in the train, and their frames contributed to the water penetration at the sill profile and the frames. In General, ZIL-158 was an example of how not to design the body. 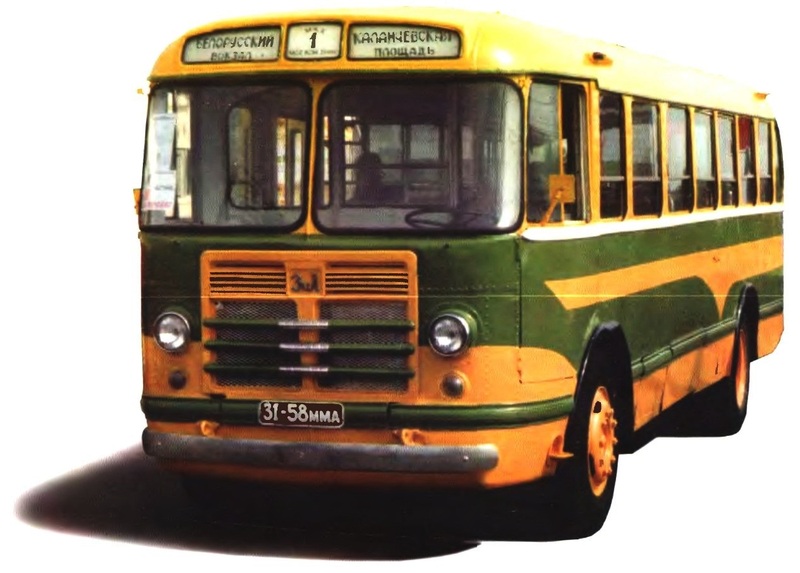 In 1959, production of buses was transferred to Likino plant, where from 1959 to 1961 were manufactured bus, which was different from the harvested on the ZIL only the logo and less build quality. To replace him in 1961, came the ZIL-158В (LiAZ-158В), equipped with an engine with increased compression ratio, new gearbox type ZIL-164А (130), the other cardan shafts and outboard bearings, Parking brake drum type gear reduced from 9.28 to 7.63 ratio. In addition, were withdrawn to the farm of the body, and between the third and fifth farms installed additional beam. More curved steel bar under the Cathedral of the box. Selenium rectifier, which was located previously on the bracket under the radiator, mounted under the dash on the right. Instead of three small heaters in the lounge there is one large one in Matousec right, as evidenced by the impressive size of roof vents. Later during the overhaul of buses older versions of the heaters was converted into a LiAZ-158В; also replaced drive shafts, outboard boxes, and Parking brake. In 1963, modernized instrument panel in the driver’s cab on a single panel mounted all the instruments: speedometer, two-point gauge and control devices of the engine. In this form the car was produced until the end of 1970. 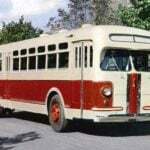 Total production of ZIL and Lyase amounted to about 65 thousand buses, which in those days was quite a lot, and as a result, the bus ZIL-158 was not only active in large and small cities and in the farms. Basic aggregates for these machines were used from cars ZIL-164 ZIL-164А, so in relation to engine and transmission problems with spare parts was not. 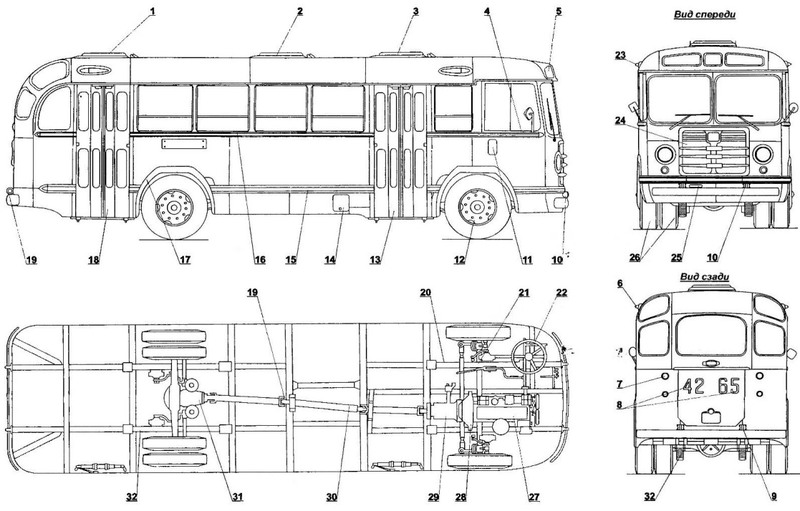 The weak point of these buses were remote gearshift mechanism, the so-called gun, whose design was rather complicated. In the case of its hinges, even a small backlash stroke of the lever in the cockpit was huge. The engine ZIL-158 was a modification of the bus engine ZIL-164 and differed in another pan (on ZIL-158 had the swage line under the front axle), in other oil receiver and the exhaust manifold (on ZIL-158, he was sent back, not down), new spacer under the fan, changed the mount of thrust to the other camshaft, starter, alternator and its bracket. Despite its small capacity, the engine was very successful for the bus. Thanks nizhnekayancha the engine timing gasket under the head you can change literally by the hour. At low speed the engine was running so quietly that it drowned out the noise of the compressor. Engine crankshaft had seven native and six connecting rod journals, their nominal diameters were respectively 66 and 62 mm cylinder Block cast iron deep sump, wet-type, molded together with the shells. 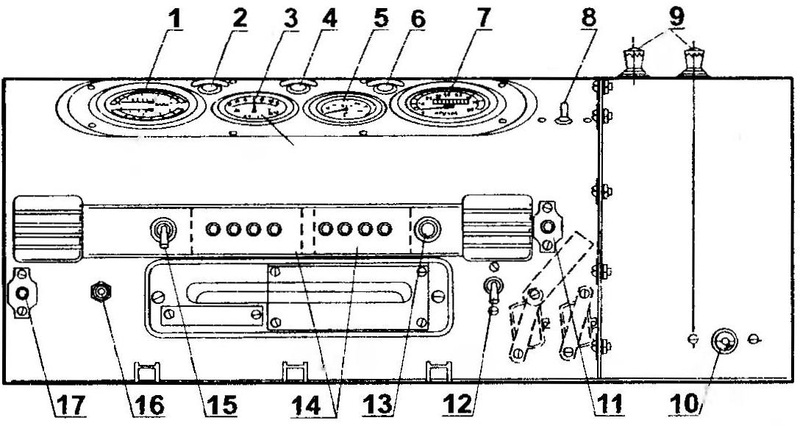 The oil pump drive and distributor (distributor) — from Cam; of an additional Cam — operated and the fuel pump. Four-row radiator is small for the used engine, why the buses in the heat sometimes “boil”. At the top of the radiator was mounted additional adjustable thermostat two fixed positions; from the top of the radiator got water heater. Bad design of the heater core is not allowed to completely drain the water from it, which often led him to “defrost”. So the drivers are “muffled oven”, why in the winter the bus was like a fridge. Lubrication system of the engine of the bus consisted of a container with a volume of 11.5 liters, radiator, pump, filter motor oil with a replaceable filter element and strainer with metal plates, which in the process of operation, had a daily (!) crank the knob. Fuel tank capacity of 150 liters attached to the brackets on the left side of the body. The grip on the buses released until 1961 disc, on later cars it was replaced by a single plate, the other was, and flywheel housing. Clutch — mechanical. On the buses the early editions of the box had a fifth light transmission, and since 1961 fifth gear was direct, so the gearbox had to do more high-speed. Ratios box type ZIS-150 the following; 6,24; 3,32; 1,9; 1,0; 0,81; 0,7. Springs were attached to the bridges from below and to the bracket body on the threaded fingers (the parts are unified with the ZIS-154 and ZIS-155) that even in those days was a legacy solution. Brakes — pneumatic, consisted of a compressor, regulator, pressure gauge, two receivers, a brake valve with a metal diaphragm, copper air tubes and pneumatic chambers of the brake mechanisms of the type ZIS-150. Steering of the machine is also of the type ZIS-150 (without amplifier), why on a stationary bus to crank the steering wheel was almost impossible. The electrical system was completed with generator G-2B, rectifier RS-21A, the relay-regulator RR-5, coil B-21, distributor (the distributor) P-21 A, clock, ammeter, as well as shades, exterior lights, a fan heater. In the battery compartment were four shestovytsya battery type FTA-84. The voltage was 12 V. To protect from overloads were bimetallic and fuses mounted in the cockpit. To alert the driver they needed to stop the passengers could use the buttons, which included a buzzer in the cab. Under the radiator the engine was located the electrical sound signals. Wipers front glass also worked from the drive.